The Verify Server page goes far beyond checks carried out on End to end Test Page. Those checks are independent of any Backup Set configuration that Users have done. Verify Server checks that the Amanda server is configured correctly in the Backup Set configuration . Like all other functional pages of ZMC, the Verify Server page has its main functionality in the center, while other common-to-most-pages functionalities are grouped at the top of the page. The main functionality of the Verify Server page is to allow users to check out that the Amanda server configuration in a Backup Set. 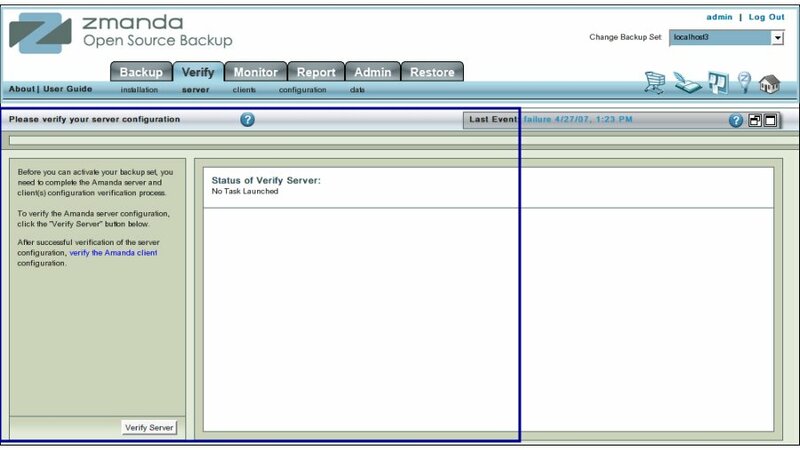 Run Verify Server whenever you configure or change a Backup Set. configuration. Do this specially if the change was on Backup Where /Holding Disk pages. Click the Verify Server Button (labeled No 1 above). The text in Upper Right Hand rectangle (labeled No 2 above) will change to indicate that the Server Verification process has started. Further progress messages/ warnings /error messages will appear in Rectangle 3 . Clicking it will restore the page to a initial clean status from where the Verify server test can be re-run. On success, users should go to Verify Client page that is on the next tab. It is strongly recommended that they Verify the clients also to ensure that the new/changed configuration is workable.